Before joining IES, Mark Schneider was a vice president and an Institute Fellow at American Institutes for Research (AIR) and President of College Measures. 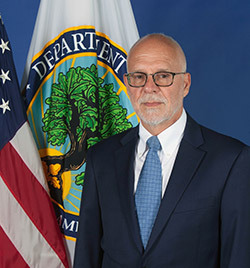 Prior to joining AIR, Dr. Schneider served as Commissioner of the National Center for Education Statistics from 2005–2008. In 2013, the Chronicle of Higher Education selected him as one of the 10 people who had the most impact on higher education policy that year. He is the author of numerous article and books on education policy. His most recent book, The University Next Door, edited with KC Deane, was published in 2014 by Teachers College, Columbia University. Other books include Getting to Graduation, edited with Andrew Kelly, published in 2012 by Johns Hopkins University Press and Higher Education Accountability, edited with Kevin Carey, published by Palgrave in 2010; Charter Schools: Hope or Hype? written with Jack Buckley, was published by Princeton University Press in 2007. Schneider's 2000 book, Choosing Schools, also published by Princeton University Press, won the Policy Study Organization's Aaron Wildavsky Best Book Award.